It seems that since the start of this year we've seen more and more shows that have featured an Asian travelling to Mexico for a notable fight. 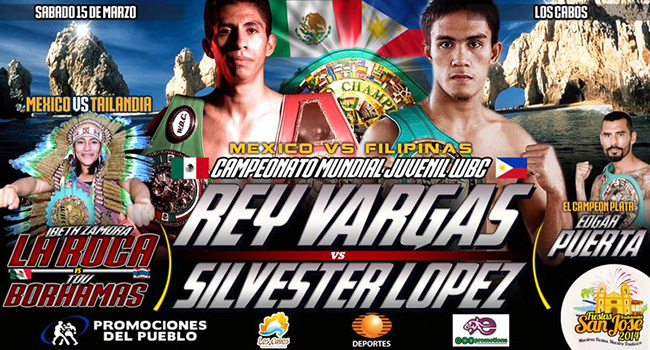 The latest of these sees Filipino Silvester Lopez travelling to fight the big punching and highly entertaining Rey Vargas in what looks to be a tremendous contest between highly regarded and heavy handed fighters. Vargas, at the moment, is world ranked and viewed by some as an emerging Mexican star. He has power, exciting fights and the style of boxing that will draw in fans. In Lopez it seems likely that Vargas will be facing his best opponent so far and this could easily be his toughest fight to date, especially if Lopez is in the right frame of mind. In regards to the poster it's and interesting on. Not amazing but interesting and eye catching. When we get eye catching posters it is pretty hard to complain about them. -Note-This card was originally set to feature Thailand's Kongfah Tor Buamas challenging WBC female Light Flyweight champion Ibeth Zamora, it appears however that that bout has now been cancelled.